Award-winning Little Learners Eastrop Messy Play classes for babies, toddlers and preschoolers; encouraging mark making and learning through play! Join us for a special Valentine’s Little Learners on Friday 15th February from 10.30 to 11.30am at the Roger Morris Centre by Eastrop Park. 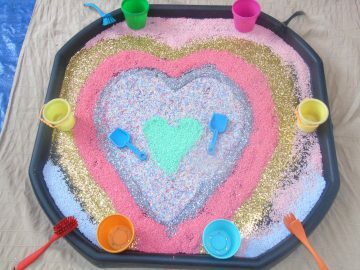 The session will include Valentine’s themed messy play, card making and biscuit decorating. Are you ready to get messy in the paint, gloop, sand, play-dough and many other exciting materials?! Little Learners is a unique and fun approach to early writing for babies to pre-schoolers from ages 5 months to 5 years. We will help your child recognise and make marks and begin to form letters, numbers, shapes and patterns. We learn through play whilst strengthening core muscles and developing gross & fine motor skills. This class is ideal for siblings to attend, as resources and activities are differentiated to suit the specified age-range. Sibling tickets can be purchased at half-price when buying a full priced ticket. Booking for this Event opens FRIDAY 18th at 8pm.